Change Co. is a brand that wants to “connect you to products that serve a greater purpose; to introduce you to companies that strive to make the world a better place.” Their quarterly subscription box is packed with artisan-made and fair-trade goods, and brands that support various causes ranging from empowering women to protecting the planet. They advertise 4-6 items per seasonal box, with up to 55% off retail pricing. They also donate 10% of subscription profits every quarter to charity. Price: $49.95/quarter. Save 10% with an annual membership. One time boxes cost $50. COUPON: Use code WELCOME10 to save 10% off your first box! Ships to: United States. $5 shipping charge for each box. I’m always interested to see the new boxes from CAUSEBOX and GlobeIn as they are released, so Change Co piqued my interest when we learned about them last year. I’m always trying to make more conscious decisions about how I spend my money and I think these boxes make great gift ideas, too. I was happy to see they are founded by two women and have a similar price point, at $50 per season plus $5 shipping, which makes this box easy to compare. The first item I discovered was this card explaining their packaging choices. Everything can be recycled or composted, and the materials are already 100% recycled, which is awesome. The box comes with a little mini magazine too, explaining more about the items in the box and the stories behind them. This letter from the founders talks about Spring as a time for growth and new beginnings. They also included this small handwritten note. I always appreciate seeing these in boxes! I prefer to reveal the booklet info as the items are shown in my reviews, but I wanted to show off this page– for the Spring 2018 season, Change Co has chosen the World Wildlife Fund to receive their financial contribution. They donate 10% of net profits each season to a different charity. These cute hair ties (which double as bracelets) are something I’ve tried before. They do seem to be gentler on hair from my personal experience, and I am loving these spring-ready patterns and colors! I thought these were notable too because of the notched “v” cut at the edge of the elastic; usually I feel like these types of ties are just cut at an angle, and this adds a little bit more polish. Every product sold by Banded provides 3 meals to a child in need. The booklet provides more context, adding that Banded works with existing meal charity programs in Uganda, Latin America, and the Caribbean. I had nooooo idea what this product was when I first pulled it out of its box. What is a “mirror bump”? This laser cut bamboo tag is meant to be hung from your rearview mirror in your car, and give you a visual “bump” to stay in the moment and keep your mind present while driving. As someone who is perpetually trying to stay focused on the current moment, I do really like this message! More detailed instructions on how to use this item are included. We also got a coupon for 10% off the RHRN store. They also included a rubber bracelet with their reminder message, too. I do think having cues like this is helpful if you’re trying to practice mindfulness in your day-to-day life. What do you think? 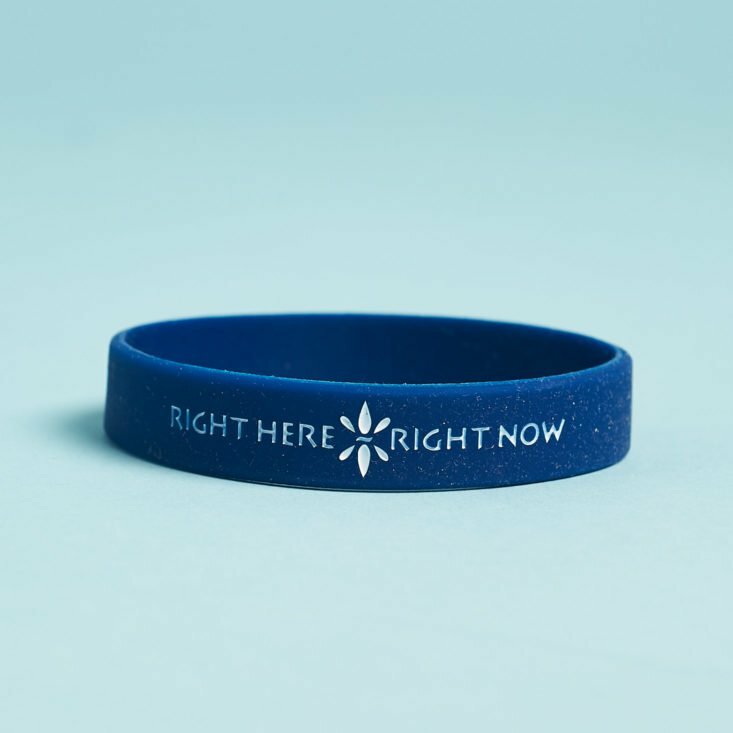 Right Here Right Now donates 5% of their profits as well. I have to say, this item looks and feels quite expensive and was wrapped very nicely. Recommended for Spring and Summer, this product is made from ethically-sourced, raw ingredients and is cruelty-free. The glass bottle comes with a glass dropper, too, since a little goes a long way when it comes to facial oils. Made in the US, this blend of oils has a light and floral fragrance. My skin is not cooperating with me at the moment and I was hesitant to introduce something new in my routine– so I tested this as a hand and cuticle oil myself, and passed the rest of the bottle on to a friend. She’s really enjoying it and has made it a regular part of her evening ritual! If you’ve never used facial oils before, I found this Dermstore post to be helpful in explaining how to use them and what the different oils do for different types of skin. In addition to being organic and cruelty-free, Apothecary 90291 donates to a variety of causes local to their roots in southern California. I love ceramic dishes and objects, and I particularly love the rich color in these two small bowls! The black texture on the reddish one is my favorite, but they look so nice together as a pair. Standing at 4.5″ wide and 2″ tall, they’re a nice size for a “catch all” on your desk or dresser, or for serving salsa at your next get together. Made in Indonesia, they are hand-wash only and are made from glazed earthenware. Ten Thousand Villages is a well-known store that is committed to supporting artisans around the world with livable incomes, by bringing their products to a broader market. Like many of you, I have approximately 1000 cheap fabric and canvas tote bags scattered around the house, and I’m rarely excited to get a new tote. I feel like I am constantly using them when I donate food and clothes because I need to find a way to responsibly get rid of them! This one though: It’s a keeper. It’s super sturdy and is a nice large size that stays open instead of collapsing flat. This message on the inside of the bag is a reminder of the good the brand does, and the help you’ve provided by supporting their mission. See what I mean about the size? It’s big, but not too big. It stands about 18″ wide, 13″ tall, and 6″ deep with 25″ handles. The booklet talks a bit more about how the brand originated and mentions that they focus their efforts currently in Wisconsin and Alabama. I really enjoyed unboxing the Spring 2018 box from Change Co. The brands are all so inspiring for different reasons, and the overall value was great too: we received $188.47 worth of products in this box! Personally I’m sad the face oil (which does make up most of the value) was not to be for me, but as I said earlier: These types of boxes make great gifts and are also easy to break up for gifts, so it’s still a win that I could hand that off to a friend who loves it. When I review a new box for the first time, I always keep in mind a few questions: Are they delivering on their message? Are they delivering on promised value and listing items with appropriate retail prices? How strong is the curation? I’d say that this is a strong showing from Change Co. All of the brands represented have great missions and were mostly new to me. The value is good and the products were described accurately, and I loved the back stories too. While there was no specific “theme” for the box like you see with GlobeIn, I thought it was more akin to CAUSEBOX in that there were several categories represented: beauty, accessories and home decor. I’ll be very curious to see what they choose for the summer box! Can you still get this box if you sign up today? Yes, it looks like this box is still available as of publication! Coupon – Use code WELCOME10 to save 10% off your first box! Like this box? Check out our list of Boxes That Give Back to find similar brands! What do you think of our first Change Co Box Review? How do subscribers rate Change Co? Do you subscribe to Change Co? Add your rating now! Can’t decide between this and Boxwalla. This box seemed to be well put together. I purchased a one time but I was charged $6.50 shipping, not the listed $5, FYI. Very nice box, excellent curation. It’s like a more sophisticated CauseBox. When I change my sub rotation in a few months, I will definitely consider adding this one. The only thing that really stood out to me is the tote, so I went to the Eye Heart World site and discovered there is a black tote, which I prefer. Shipping on that site is more than I am used to paying for web orders. The mirror bump is cute but some states (like MN) have laws about what can hang from your mirror as it can impede your view. I had a really bad experience/breakout when I tried oil *cleansing*. That is definitely different from this type of face oil, but has made me super hesitant to put more oil on my face in general. I’m kind of willing to try it again now because I have friends who swear by it, but I did a face mask recently that (I think) made me break out, so I didn’t want to risk trying a new product now until my complexion calms down again. 🙂 I tend to stick to my routine because I’ve just never been able to figure out exactly what causes my skin to freak out when it does! Not really interested in the rest of the box (pretty saturated on products right now) but I love that tote and the message/mission it supports. I never carry a tote but might have to find a reason to buy this one…. They had some other cute bags in the Eye Heart World shop, too! I liked some of the small clutch options myself. I checked the site for the tote and they sale it in black too, I have to order this bag. I need to stop reading reviews. The more reviews i read the more i sub. My favorite item is the oil, and the only item i know i will use, yet no oil is worth $110 to me. LOL. I managed to talk myself out of signing up for a sub because I wouldn’t use the face oil (already have enough I’m trying to get through). But then I spent $80 in the online shop! Oh no! You had to tell me about the online shop …… LOL. Really glad to see this box reviewed! Looks fantastic! I’m really excited about this sub! I love the giving back component and the responsible packaging (there are only so many storage boxes I need). I will never understand $100+ beauty products but that’s just me. I absolutely adore the tote. Can’t wait to see what’s next! The theme IS the box – eco friendly and socially conscious products. I really like the curation of this subscription and the fact that it gives back. The recycled materials and responsible packaging add to the value for me.